The turkeys head off for processing. This is the only time they've been caged. This morning I gathered up 40 Buff Orpington broiler chickens that have lived on pasture in 2 of our chicken scooters for the last 11 weeks. It took the Buff Orpingtons almost twice as long to reach market weight as the Cornish X batch we processed 5 weeks ago, and they aren’t as heavy still. Advantages in their favor: they ate less feed than the Cornish, ate more grass, were more active, and stayed cleaner. The Cornish have the double breast that most customers expect and taste great. We’ll see how the Buffs taste soon. I’m interested to see, because to my knowledge I’ve never eaten a chicken that wasn’t a Cornish, White Rock, or a cross thereof. The turkeys have free ranged all over our property gathering most of their own feed. We put a little broiler ration and scratch grains in a bin to encourage them to roost in the poultry shed at night (they have to be bribed not to roost in the barn rafters), but other than that little bit of feed they’ve done well at fending for themselves eating grass, acorns, grasshoppers, berries, seeds, and “their” heirloom garden tomatoes. They’ve swung on our front porch swing and chased the dog. They’ve discovered that they cannot swim and that they can perch on one of the goats. Undoubtably a finer life than 99.9% of all American turkeys. The turkeys were harder to pack off emotionally. We’ve had them since the 1st of July, and they kinda grow on you. They’re not real smart, but they do follow you around while you’re doing chores or anything else they find interesting and keep you entertained with their antics. 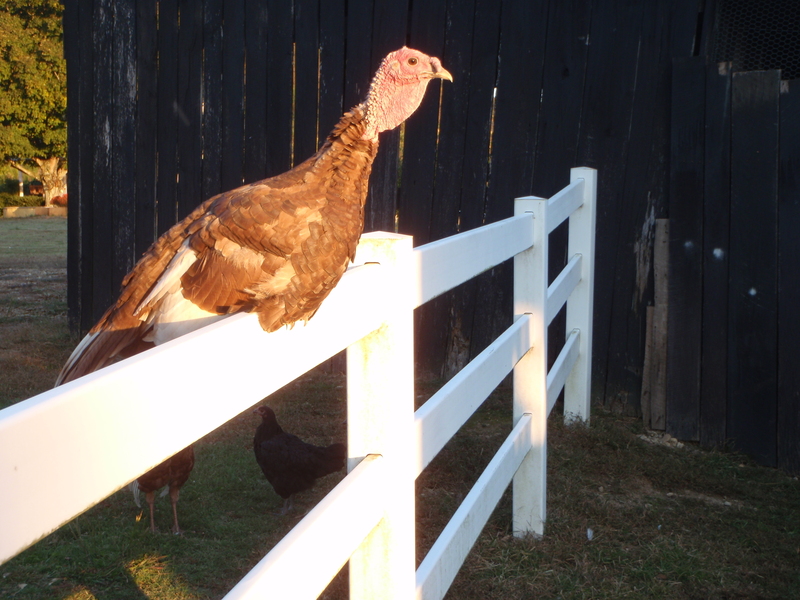 This year we’ve raised 11 of the heritage breed turkeys to a “light” market weight. I say “light” market weight because July to November is not quite enough time to grow them out completely. We’ll see how much they weigh tomorrow afternoon. 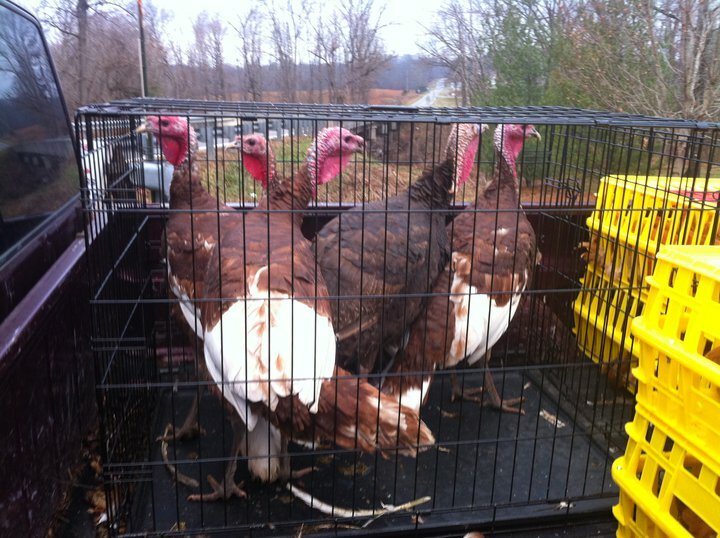 You see only 5 turkeys in the picture because the other 6 have received “pardons” this year. We’ve sold 3 of them and are eating 2 with our families at Thanksgiving, but the other 6 will be breeders for us in the spring. We kept one tom and two hens of 2 rare heritage breeds – the Black, or Black Spanish, and the Chocolate. We processed four Bourbon Reds (3 toms and 1 hen) and one Chocolate tom. We’ll let you know how they are on the table.